If you are looking for a cruising yacht that will rapidly take you to far away places in a safe and reliable manner, it would make sense to consider the yards that build offshore raceboats. Pogo and Django don’t just share strange names, but follow similar philosophies. Their experience in building strong, yet lightweight ocean racing yachts also forms the backbone to their fast cruising lines. Both companies are based near Concarneau in Brittany, France, with a history of building ‘Minis’, or Mini Transat 6.50 class yachts. Pogo produces the dominant series for this discipline, as well as for the Class 40 fleet. These yards, Pogo Structures and Marée Haute, produce strong builds, finished with simple, minimalist interiors, with an emphasis on stability, safety, speed and functionality. The fact that their racing boats are designed to sail solo or short-handed means that features are also carried over to benefit their cruising lines. 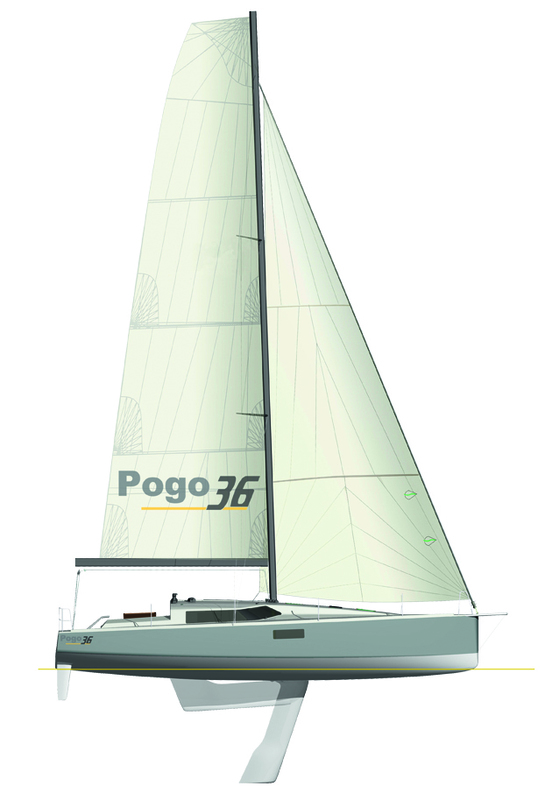 The Pogo 36 looks like an absolute weapon, a Class 40 scaled-down to a high-speed cruiser that will weigh a mere 3.6 tonnes. The masculine looks may be off-putting to some, but for those with a penchant for speed or short-handed cruising (or both) the renderings of this new 36 will make you as excited as a school kid in a tuck shop queue. She doesn’t even launch until 2016, but already tops my wishlist of new yachts to sail. I was impressed with the formidable Pogo 30 and the 36 looks like a larger, more powerful sibling, with tricks learned from Pogo’s recent Class 40 S3. Winches are sited on the coachroof, just like the 30, to keep a clean cockpit. And the combination of twin tillers and deep lift keel illustrate her mix of sporty potential and cruising versatility. The 36 will replace the 10.50, which was the first fast, lift-keel cruiser from Pogo – she launched in 2006 and 76 have been built. Designer Finot Conq has given the 36 more rocker and thinks her performance should be better in light breeze. The mast is positioned further aft and carries a square-top main. The coachroof is long to maintain headroom forward, allowing the option of three cabins with a forward heads. Finot Conq has given this the stealth bomber treatment, a look piloted by the JPK 1080 and Sabrosa Class 40. Not only do those right-angled windows give her a mean, aerodynamic look, but provide forward viewing from the navstation or saloon. Projected launch is early next year and a price has yet to be confirmed, although it’s thought to be similar to the 10.50. Like Pogo, the roots of the Django line lie in the Mini Transat. The yard started in 2004 with the launch of the Dingo 1, a series-built 6.50 Mini designed by Pierre Rolland. Current clients of its cruising range like to sail off the beaten track. 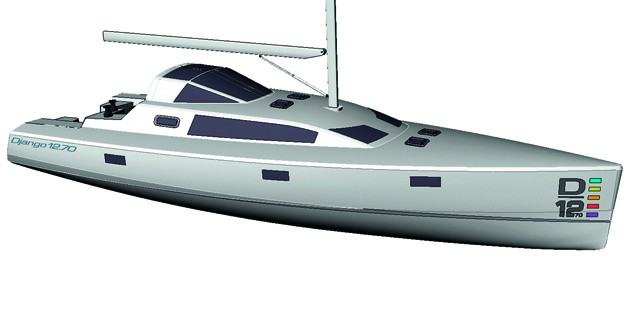 The first new 12.70, for example, will sail to Patagonia, where a Django 7.70 owner already cruises. And another Django owner is sailing to every French island on the globe over three years. It was the launch of the first Django 7.70 five years ago that put this name on the fast cruising map. I sailed the 6.70, a cruising version of a Mini, and was impressed by her space, speed and simplicity. The strong, lightweight infusion builds, together with shoal draught keel options has ensured the company has a loyal following. The beam of the 9.98 affords good accommodation in three double cabins, plus generous stowage aft. The mainsheet traveller is abaft the rudder shafts to free up the cockpit, and she looks easy and fun to sail at speed short-handed. The first Django 12.70, also due for launch in July, is sailing to Patagonia, hence the protection from this fixed-roof option. The option for a mainsheet arch is also provided, as is the choice of a fixed or swing keel. 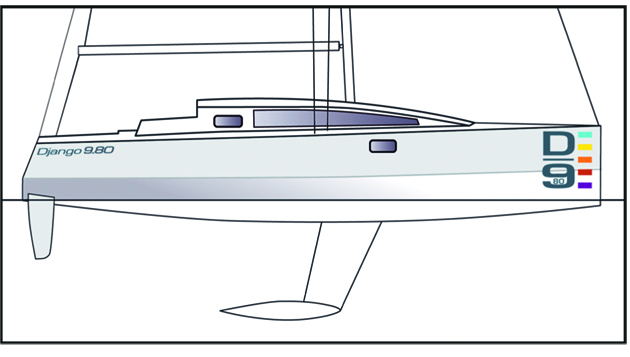 The swing keel allows her the ability to dry out with the addition of beaching legs, which attach to the chainplates. The 12.70 is built in infusion sandwich with strict attention to weight distribution. The anchor locker is located abaft the foredeck, for example, to keep chain weight central and reduce pitching. The interior layout is kept open and flexible.